IIM-A's incubation centre stands out for its sector-specific focus and readiness to acquire equity in the start-ups it backs. It is a friendly, nurturing environment at the Centre for Innovation, Incubation and Entrepreneurship (CIIE), the Indian Institute of Management, Ahmedabad's unit for mentoring start-ups. Nalin Avasthi, founder of Mayavi Communications, an email-security solutions company, has been here for two years, trying to get his start-up off the ground. He is still struggling to find customers, but the CIIE is helping him in every respect, and he remains hopeful. After all, video communications start-up VMukti Solutions, also mentored by the CIIE, took more than two years to get off the ground but has since acquired more than 100 clients, including Google and some state governments. "Brand IIM-A worked for us in getting initial customers," says Hardik Sanghvi, CEO of VMukti Solutions. There are also Mohit Rangaraju and Arpita Kapoor from Gwalior, who together recently founded gaming company Mech Mocha. But they will not be at the CIIE for more than four months. They are part of a bunch of youngsters being mentored under iAccelerator, which focuses solely on ventures in information and communications technologies. The CIIE was set up in 2002 as a research institution, with a grant pool from the Gujarat government, the Department of Science and Technology (DST) and IIM-A. It turned into a full-fledged incubation centre in 2007, when it was incorporated as a Section 25 - or non-profit - company, a legal requirement for incubators. Since then, it has mentored 68 start-ups. "Most start-ups fail not because of technology failures, but due to wrong management decisions," says Kunal Gupta, CEO, CIIE. "One of the key reasons the CIIE was set up was to help them make the right ones." He is an IIM Ahmedabad alumnus who let go a lucrative career in financial services to encourage start-ups. Harkesh Mittal, Secretary, Technology Development Board, DST, agrees. "While incubators in technology institutions such as IIT Bombay or IIT Madras have an edge in technology, management institutions score better on business models," he says. So what sets the CIIE apart? A key feature is that, unlike most other incubators, it has created specialised programmes to suit different sectors. While iAccelerator supports mobile and internet start-ups in a four-month long programme, Infuse Ventures helps clean-tech focused efforts, and has a physical incubation programme that can go on for two or more years. This is because companies in IT and mobile or those that are internet-based can take off more quickly with lower capital than those in clean tech. Similarly all initiatives to support start-ups working in the health and education sphere are grouped under Aarohan Ventures. A second distinctive aspect is that the CIIE is self sustaining. Incubators help start-ups devise effective business plans, but often themselves need external support to keep going. The funding to build their infrastructure, offer soft loans or acquire equity in the start-ups they back usually comes from grants by different institutions. The Technology Development Board, for instance, invests around Rs 30 crore in 20 incubators every year. "We expect most incubators to meet their own costs, either through rentals or through returns on equity in start-ups, at the end of three to five years. However, the CIIE is among the very few incubators to have done it," says Mittal. Instead of depending entirely on government grants, the CIIE has been active in reaching out to corporate houses and other agencies for sponsorships to back its programmes. Tata Communications, Verisign and Nokia, for instance, have been regular sponsors of iAccelerator. The Piramal Group has been sponsoring the Piramal Prize for selecting and incubating health-care start-ups, while the Asian Development Bank backs the clean-tech boot camp. "Sustainability is not an issue for us any more," says Gupta. Again, many incubators, while offering guidance, shy away from actually investing in start-ups, but not the CIIE. "We are internally debating whether we should raise funds or invest in start-ups,"says G. Sabarinathan, Chairperson, N.S. 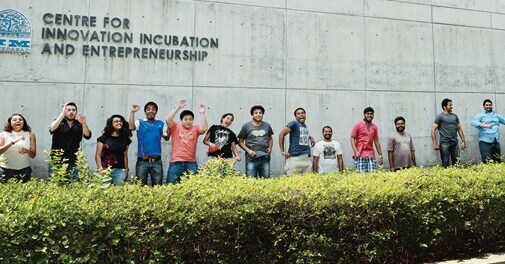 Raghavan Centre for Entrepreneurial Learning (NSRCEL), the incubator at IIM Bangalore which acquires equity in exchange for offering rental space, not funding. "Funding is what venture capital funds and angel funds do best, not academic institutions." Mittal at the DST differs. "There could be conflict issues, such as an incubator seeking financial returns, instead of soft incubation, but investment by incubators also increases their own expertise and raises their stake in the companies in which they do so." The CIIE, however, sees no dilemma. It has invested in all the 68 start-ups it mentored, putting in a total of Rs 9.1 crore. It has even made some profitable exits, such as from Innoz Technologies, which enables SMS-based search, and which delivered a 5X return. It expects to do more of the same in the future. In IT and communications start-ups, the ones mentored by iAccelerator, the CIIE usually invests between Rs 2 and Rs 20 lakh for a seven to eight per cent stake. Its investments in clean technology start-ups are much higher, between Rs 50 lakh and Rs 5 crore, but have also been the most successful. One stand out success is Ecolibrium Energy involved in smart grid technology to monitor power usage by large power consumers. Founded by brothers Chintan and Harit Soni, the start-up has more than 90 paying customers. Another is Chennai-based Aspiration Energy, which produces solar water heaters. Indeed, in May this year, the CIIE launched a separate Rs 125 crore fund, Infuse Ventures, exclusively for clean energy start-ups. "Clean tech start-ups are much more capital intensive and risky. This is one sector where there is no point incubating unless you are investing as well," says Gupta. The CIIE has also forged partnerships with numerous organisations, both within the country and without, to further help its start-ups. In partnership with a German company GIZ, for instance, it runs a programme called MentorEdge, which consists of holding workshops in eight different locations, together with local NGOs and government departments, to train entrepreneurs. Again, the US venture firm Village Capital, during an acceleration initiative it took from May to July this year, providing grants to social start-ups, has funded the CIIE backed Edsix, which provides education in the garb of entertainment and iKure, which is into health-care, giving them Rs 25 lakh each. It also helps other incubators such as the Goa-based Centre for Incubation and Business Acceleration (CIBA), to identify the start-ups deserving of support. It is working on setting up a separate incubator called Startup Oasis in Rajasthan, in partnership with the Rajasthan State Industrial Development and Investment Corporation. Overall, however, incubation in the country has still a long way to go. Of the 4,000 odd business schools, only a handful have paid heed to the need to nurture entrepreneurs. "For more than a billion people, we don't have more than 110 incubators. China has 800, Taiwan has 400, Korea has 430, US-Canada have 1,300, Brazil has 380," says Dinesh Awasthi, Director at Entre-preneurship Development Institute at Ahmedabad. Their success rate is also relatively low. "Most incubators manage one success story or two in 10 years," Awasthi adds.